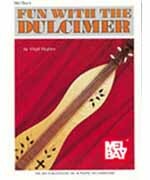 This beginner's method presents clear, concise instruction for learning to play the traditional three-stringed mountain dulcimer. Thirty-eight songs are taught with notation and fret numbers for each note. Chord symbols are also included for playing with guitar, banjo, or another chording instrument. Melody playing with drones and basic chord playing are both taught. Lyrics are includes with the songs for added fun. From the time this text was first published, it has been a steady best seller.